As a small business we are able to ideally focus on your needs. Our services include web site design and hosting, print ready advertising media, Multimedia presentations and production of promotional DVD's and branded goods. At GPIMedia we focus on what the customer really wants, offering advice along the way so that your dreams become a reality. Which-ever of our services you decide to use you will find our prices very competitive and we aim for service second to none. Within this site you will find more specific information about our services feel free to browse around or contact us using the options within the site. GPIMedia started off through providing web sites, content and presentations in the mid to late 90's. Initially I was designing web sites for the clubs I was interested in. This was during the infancy of the Internet and all pages and content had to be programmed by hand, all graphics and images needed hours of processing as digital photography had yet to come to fruition. As time went on people who new me through the clubs started asking if I could provide web sites for their businesses. This I did often for little more than a few beers. As word got around I was asked to do more web site work of a more complex nature. It is from this I developed GPIMedia. I now have a small number of ad-hoc designers and a number of projects and sites running for individuals. 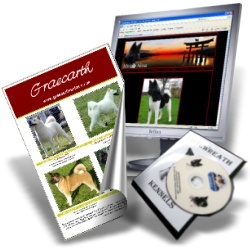 Because of our personal interests most of our current sites are based around the canine community, we will however produce a site for any business small, medium or large. In addition to our web sites we also offer printed advert design with print ready copy, multimedia presentation design and production of promotional DVD's. These products we have developed from requests of our customers. Additionally we are able to offer a range of customised goods and gifts branded with our customers logo or details. This is carried out through a partner business but we do have many items which we can produce 'in-house'. We look forward to hearing from you and remember no enquiry is too small or too large.